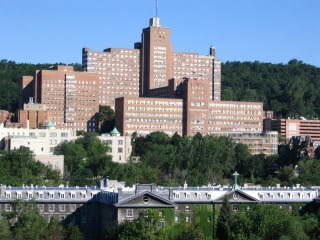 The Montreal General Hospital is built on a hill — the hill, Mount Royal. This (above) is how it looks when you're looking up the hill and if you enter from this side, through Emergency and Out-patients, you're on the first floor. But if you walk around the block — quite a long irregular block — you'll come to the main entrance to the hospital and when you go in this door, you're already on the sixth floor. 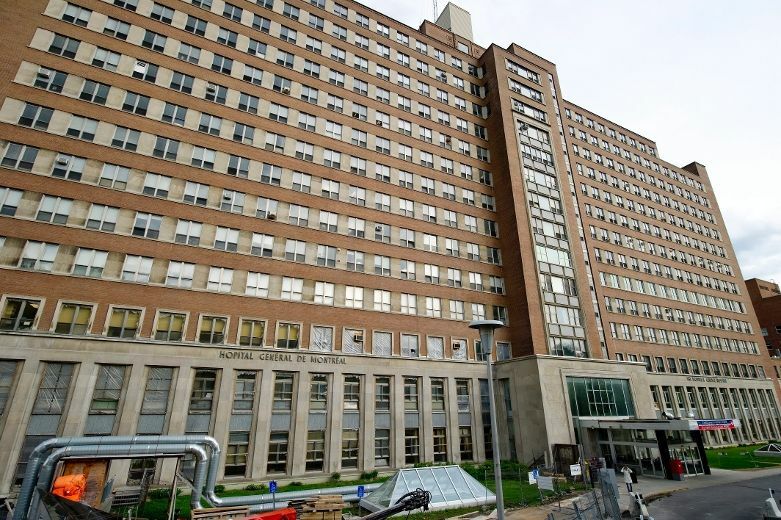 I worked on the sixth floor for a couple of years in the mid-'60s, as a young graduate on a brand new ward called the Diagnostic Unit, 6 West. Looking back, I think what a coveted job that must have been and how lucky I was to have such a job. The patients on 6 West weren't sick. They were there for tests, for diagnostic purposes. They were all up and about, they ate in a dining area near the nursing station, they mostly took care of their own personal needs. There was a kitchen next to the dining area and they could freely use the kitchen for snacks — some of which were provided, some of which they or their families brought in. 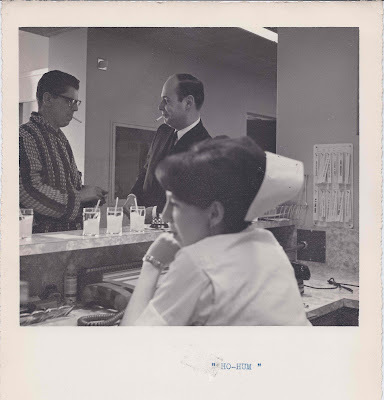 As nurses on 6 West, we did a lot of paperwork; we kept track of all the tests, made sure our patients were prepared for testing — whether they needed special medication, needed to fast, needed a close record of vital signs. We made appointments with the various labs and departments and transported our patients around the hospital as needed. There was plenty to do but no bed-baths, no bedpans, no enemas or other nursing treatments, no back-rubs or passive exercises or IVs. There was a very casual atmosphere there, an informality that we had never experienced on other floors. I remember many patients I had there but this is a story about just one. I'll call him Mr. J. I thought of him as "older" but I was in my early 20s and now that I think about it, I suspect he was in his 30s. He was very good-looking and charming and he liked me a lot. He wanted me to call him by his first name but I didn't. There were two other guys around his age there at the same time — the three of them hung out together. They liked me too but I think of them as his wingmen — they were very careful how they treated me because they thought of me as "taken." You can see that hospital life was very different in those days. People smoked everywhere (not the nurses though; we never smoked in view of our patients). The little glasses with the thermometers in them were a 6 West thing: our patients came along and took and recorded their own temperatures on a little nearby chart. I treated Mr. J. with the same warmth and friendliness I had toward everyone. I never encouraged his romantic overtures and I shut him down quickly when he wanted to talk about the problems he had at home and how he and his wife were having serious marital difficulties. I told him I could make him an appointment to talk to someone about that but it wasn't me. I worked a lot of nights on 6 West. Mr. J. always knew my schedule and he and the pals would usually stay up late when I was coming on. He would send the others to bed at a certain point and sit nearby while I worked on my paperwork. I almost always had to really persuade him to go to bed because I'd be expecting the supervisor on her rounds and I didn't want to get caught. One night, alone on the floor, I was working through my nightly list and, with my arms full of equipment, I went into the treatment room. I heard the door close behind me; I turned and it was Mr. J. I put my stuff down and asked him what he was doing up. He said he couldn't sleep. He came toward me and reached for me, trying to put his arms around me. I put one arm straight out and said, "Stop this." He told me he knew the supervisor had already been there on her rounds because he had been keeping watch. He tried to overpower me. He was quite persistent and a lot bigger than I but I fended him off and managed to reach the other door of the treatment room which led into the nursing station. I put my hand on the phone and told him I wanted him to go back to his room and we'd pretend this had never happened. I certainly had no wish to call anyone; neither did I want to fill out an "incident report." Here's why: If I had described the incident to officialdom, there is only one answer that I could have given that might be accepted as they bound my wrists and led me to the stake. It didn't matter that I had never encouraged him. It didn't matter that I was simply re-stocking my treatment room, as was my job. The only thing I could have said was, "This was my fault. I'm sorry it happened. It will never happen again." And they probably would have burned me anyway. This story has a point. I'll be back later to let you know why I wrote it. (It's right here.). It is how it was with our various Mr J's, at that time, and clearly, now also. Why on earth did JG keep emails for 10 years. I did not think email existed 10 years ago.